At Christmas we get caught up in the busyness of it all, don’t we? We forget why we are doing all of the things—shopping for gifts, decorating the house, planning meals. But may I encourage you to join me to really consider the One whose birth we celebrate? And to follow his example to live an emptied life this Christmas season. We often think of Christ’s sacrifice on the cross at Easter. But do we consider his sacrifices at Christmas time? He was in the form of God, yet he set that aside for us. He gave up the glory that he had with God before the world existed (John 17:5). He gave up his riches (2 Corinthians 8:9). He gave his life. On the cross. The shameful, painful death of a criminal. For us. And we are called to be like him. Yes, we give Christmas gifts to one another as a way to remember Christ’s gift to us. But what gift can we give to him? Why is this so hard for us? Why is it so hard for me? I can be so selfish, conceited. I count myself more significant. I look to my own interests, or what I feel I have a right to. It is as if I live life with an “It’s all about me” mentality. But Paul urges me—he urges all of us—to have the mind of Christ. Christ the one who sacrificed so much in birth, and life, and death. Jesus set an example of how we should live. For how we should give the most meaningful gift to those around us. This Christmas, let us commit to follow his example. To humble ourselves, serve others, to give. Let’s reflect on this passage as we prepare our hearts for celebrating the birth of our Savior. 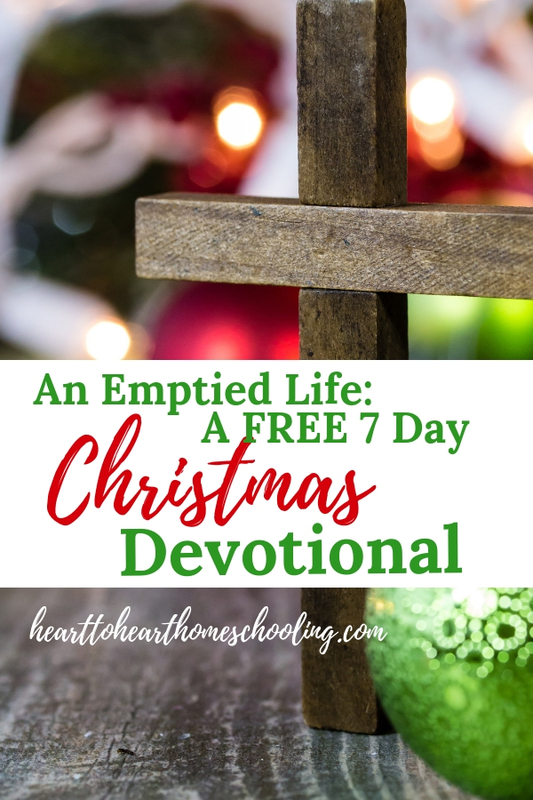 Subscribe below to receive An Emptied Life—A 7 Day Christmas Devotional for FREE! Subscribe to get your free Christmas devotional download. Such a beautiful reminder. Thank you! Humility is something that is learned through suffering. We gain perspective and see through other people’s eyes. So true, Susan. Thanks for sharing your insight. Beautiful! I love how you intertwined Philippians back in. That entire chapter is so powerful! Thank you, Lauren. It is an incredibly powerful chapter. And a bit mind-blowing. Very true! It’s easy to get caught up in checking things off our to-do list, thinking it is helpful to other people when it’s often done out of selfish motivation. My husband and 2 elders from our church have a podcast. I write their show notes and keep the website updated. The one they published today is practical tips for focusing on other people at Christmas time and titled “How NOT to Be a Selfish Pig During the Holidays”…so I’ve been thinking about some practical ways to live this out as I consider some of their ideas. It is so easy to lose our focus—the one we really want to have deep down. I love Hebrews 4:12 that says “For the word of God is living and active, sharper than any two-edged sword, piercing to the division of soul and of spirit, of joints and of marrow, and discerning the thoughts and intentions of the heart.” (ESV) The Spirit uses the Word to reveal what is in our hearts, the thoughts and intentions behind our actions. May we have the wisdom to open His Word and allow the Spirit to work in our lives. This really spoke to me today as I have been considering what humility and giving up of oneself really looks like. Beautifully written. Thank you!